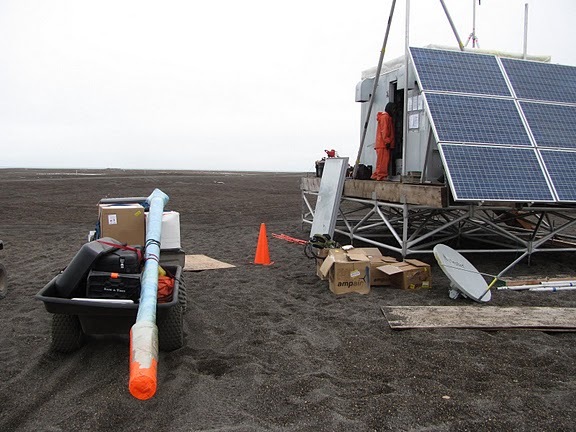 The University of Alaska, in collaboration with Remote Power Incorporated, has developed an autonomous power and communications system to enable collection of ocean surface currents in remote locations. 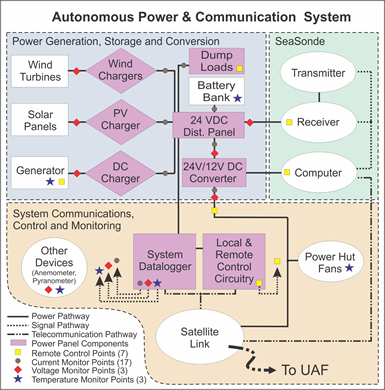 The Remote Power Module (RPM) is a fully–automated, hybrid power station designed for arctic and sub-arctic maritime environments. 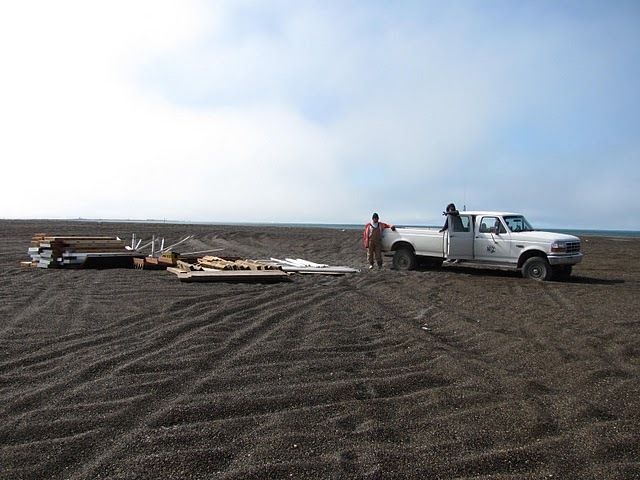 It provides a remotely deployable platform with a compact footprint amenable to the stringent permitting requirements that govern many coastal areas. A rugged, durable and climate controlled shelter houses high-frequency (HF) radar electronics, communications equipment and electrical system components of the power plant. The system is designed to reduce operating costs through a reliance on renewable energy inputs. It is designed to generate 10 KWh per day, sufficient to power a CODAR Ocean Sensors Seasonde HF radar, a high-speed satellite communications link, an instrumented meteorological station, and power monitoring and control equipment.. A fossil-fuel based generator is employed as a backup power source so that costly maintenance visits and ongoing logistics and fuel costs can be minimized. Commercial off-the-shelf components were selected and tested to ensure electromagnetic compatibility with the Seasonde instrumentation. The RPM is modular and highly portable, designed to be deployed and serviced using small planes, boats, four-wheelers or snow machines. Component redundancy ensures reliable operations under harsh environmental conditions. The RPM is supported by a compact multi-point foundation 16’ wide by 20’ long. This trussed aluminum frame with 12 vertically adjustable feet is assembled quickly over uneven surfaces and unstable soils. A wooden deck is affixed to the foundation with a four foot cantilevered overhang which forms the solar array attachment. Raising the array prohibits snow from piling onto the solar panels as well as minimizes potentially disruptive wildlife visits. 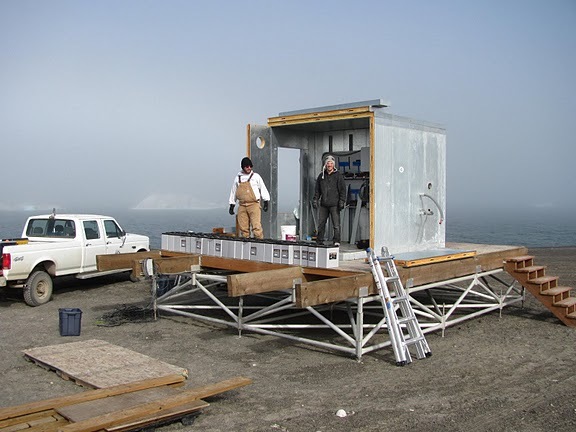 The shelter is a walk-in freezer composed of 30 foam and aluminum sections secured together by a system of cam-locks. The shelter is 8’ wide, 12’ long and 10’ high with no single unit weighing more than 75 pounds. It has two rooms, one for electronics and one for the backup generator and fuel delivery system. The four-inch thick walls, floor and roof provide an R-34 insulation rating. Wind turbines mounted on towers at each corner of the hut together generate up to 2.4 KW. The four turbines are sized to supply 100% of the system power when the wind speed is greater than 11 mph. The marine grade turbines are small, lightweight and quiet with overspeed governing automatically controlled by blade pitch adjustments. A 3.5 KW photovoltaic array is mounted on standard rails. Two maximum power point tracking solar charge controllers optimize the charging efficiency of the system. The generator is a 10 KW diesel engine powering a 24 volt DC alternator. The alternator has a rated output of 170 amps enabling rapid, temperature compensated charging to the battery bank should no renewable resources be present for extended periods of time. 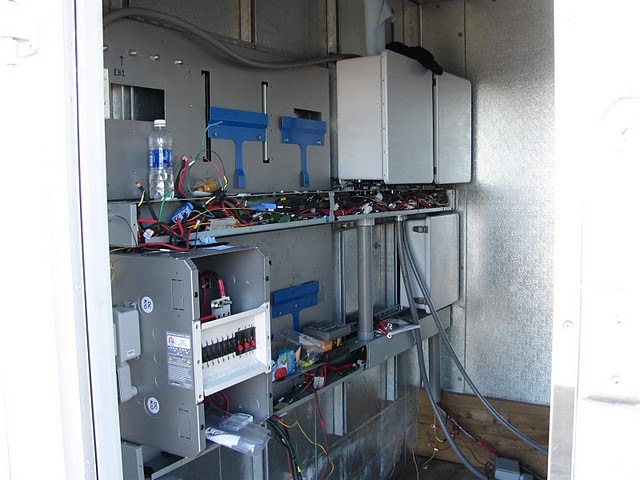 The generator system is remotely configurable and fully automated; it requires service intervals at 500 hours run time. Slight modifications to the fuel delivery system allow switching between diesel or biodiesel fuel enabling a certain degree of flexibility with regards to permitting requirements. A 2,800 Amp-hour absorbed glass mat battery bank provides three days of standby power. These sealed, maintenance free batteries are exempt from DOT shipping regulations thereby easing the burden of complex HAZMAT documentation and transportation logistics. Near real time monitoring of the system is accommodated with an onboard data logger. Data on power, voltage, temperature, wind speed and solar radiation will be regularly logged on site and displayed on the web for the purposes of evaluating system performance and/or control of the system remotely. Satellite communications provides a high speed, wireless internet service to deliver measurement data, permit remote configuration changes and report power system status. 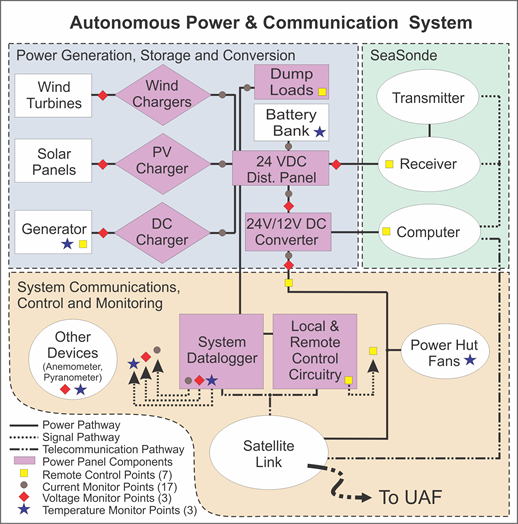 Overview of the autonomous power and communications system indicating the major subsystem breakdown and primary monitoring and control points. The three sub-systems have different background shading. Purple shaded components indicate components on the wall-mounted power panel. (UAF is the University of Alaska Fairbanks.) Click on the plot to see a full screen image. 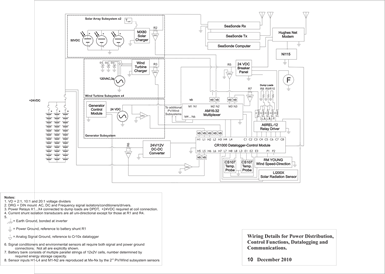 Wiring schematic for the power distribution and monitoring system. Click on the plot to see a full screen image. Time series of environmental attributes collected at the RPM: solar insolation (top), wind speed (middle), and ambient air temperature (bottom) during the 2010 test phase in Barrow, AK. Click on the plot to see a full screen image. 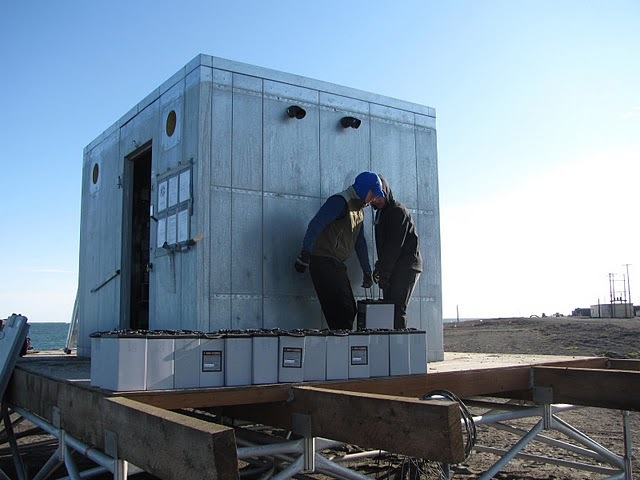 Time series of series of power production attributes collected at the RPM:battery bank voltage (top), solar panel current production (middle), and wind turbine current production (bottom) during the 2010 test phase in Barrow, AK. Click on the plot to see a full screen image. 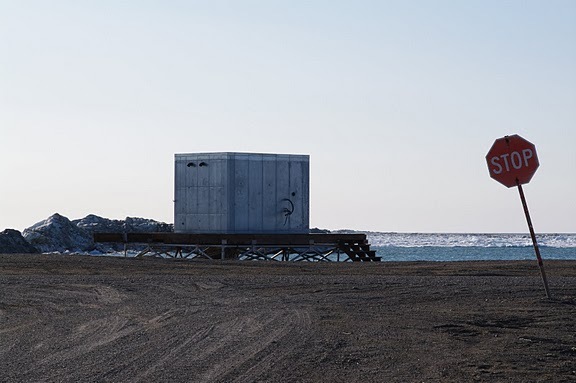 Our goal is to build a power and communications system that addresses the challenges of operating HF Radars for surface current mapping along remote Alaskan coastlines where power is not readily available. With HF radars, a detailed map of ocean current speeds and directions is generated each hour. These measurements are critical for efficient contaminant spill tracking/prediction, Search and Rescue, marine navigation, operations, ecosystem research, and coastal zone management change. We are currently evaluating the potential of utilizing the RPM as a host for additional sensor suites such as vessel tracking AIS transponders, air quality recorders, ice-tracking radar, and VHF transceivers. 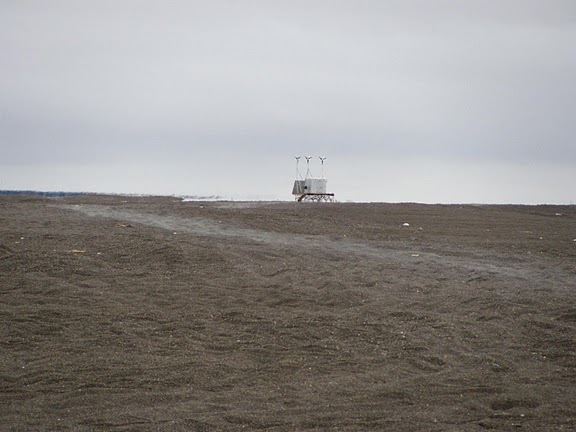 A successful three-month system test of the RPM in Barrow, AK, was completed in Fall 2010. The unit generated 100% of the power needs from renewable alone and so without a single startup of the backup generator It is currently shut down and winterized. A manuscript describing the RPM and the results of its first test is in preparation For the Marine Technology Society. 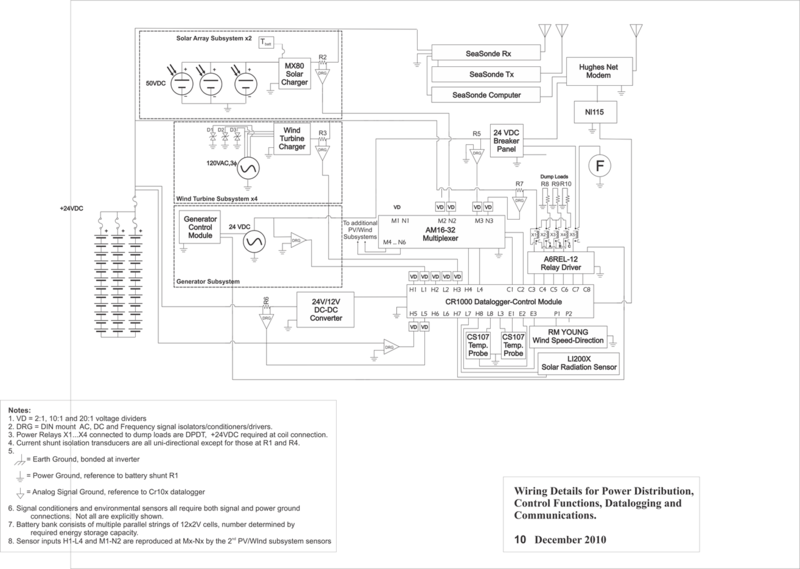 In addition, a full documentation package is being prepared that will include design schematics, and operating and troubleshooting manuals. 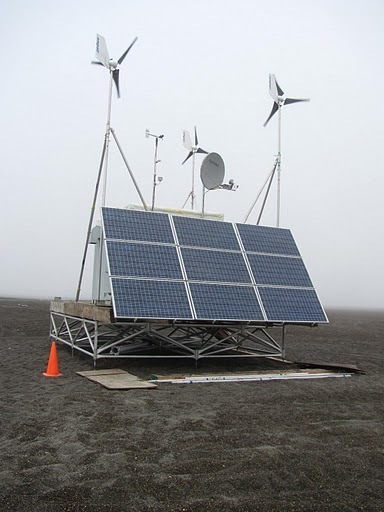 The data collected in Barrow will be used to develop an empirical model useful for accurately sizing similar renewable energy systems based on available environmental data. The RPM spent the winter on the shore in Barrow. It was taken apart, and the pieces were moved by truck to the end of the road. 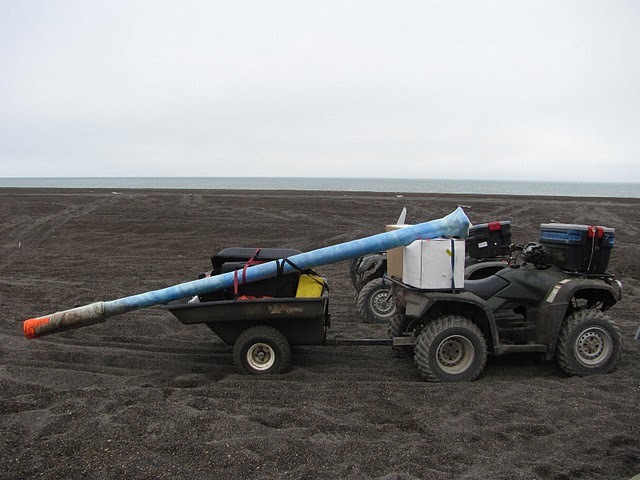 ATVs moved the components from the end of the road to the deployment location. The deck and shelter were assembled, and the electonic components and batteries were installed. The power generating systems were installed. Finally, it was left alone to do its work. Click on the link below to watch a video of the RPM collected during a storm in Barrow, AK. copyright © 2010 art lab | Last modified: April 25 2018 00:49:51.